Published 12/15/2010 . Last updated 9/15/2017 . These Christmas stollen cupcakes stole my heart. I got the stollen pun out of the way in the first line. Now you (specifically my Dad, the pun master) can proceed with reading the stollen cupcake post without waiting to see if/when I would use the bad pun. Each year, I like to share a new Christmas cupcake recipe (’tis the season for baking)! I’ve made gingerbread cupcakes, eggnog latte cupcakes, mulled wine cupcakes with roasted chestnut frosting, and panettone cupcakes. As I was debating what to make this year, I received a free copy of the inspiring book A World of Cake by Krystina Castella. A World of Cake is not a recipe book (although it is jam packed with recipes); it is a history book. It traces cakes all over the world from the first cakes in 5000 BCE to those baked up today. Any casual baker with even the slightest interest in history would find A World of Cake a captivating read. Why didn’t we study the history of cake instead of the boring details of wars when I was in Junior High? We could have also skipped the history of the British royal family and instead reviewed the cake family trees where similar cakes (like all fried cakes, for example) are plotted family tree-style to show how they are related to each other. Stollen is thought to have been first made in the early fifteenth century as a Christmas cake, and it is still being made for that holiday today. The folds of the cake, topped with white sugar, are said the represent the baby Jesus wrapped in swaddling blankets. Dresden is the epicenter of stollen preparation, with a huge festival called Stollen Days held at the beginning of December to launch the Christmas season. I slightly modified the stollen recipe from A World of Cake and also transformed it into cupcakes for this year’s Christmas cupcakes! I knew that Krystina would approve of the transformation because, in addition to writing A World of Cake, she also wrote the hugely popular book Crazy About Cupcakes ! 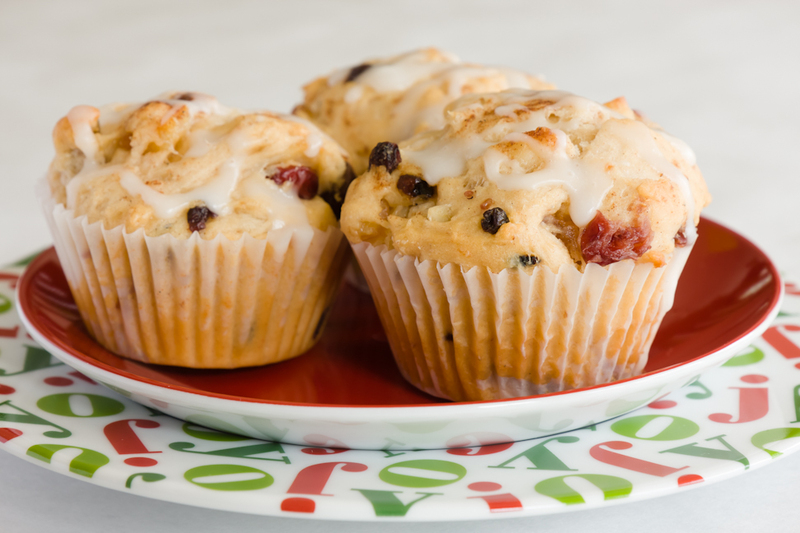 These Christmas stollen cupcakes are breakfasty and would be best served on Christmas morning – they are loaded with fruit (so they are sort of healthy, right?) but they are certainly not the dreaded ultra-heavy fruit cake. This is a recipe that can easily be modified. Look at my list of mix-ins, but feel free to play around and add your own! 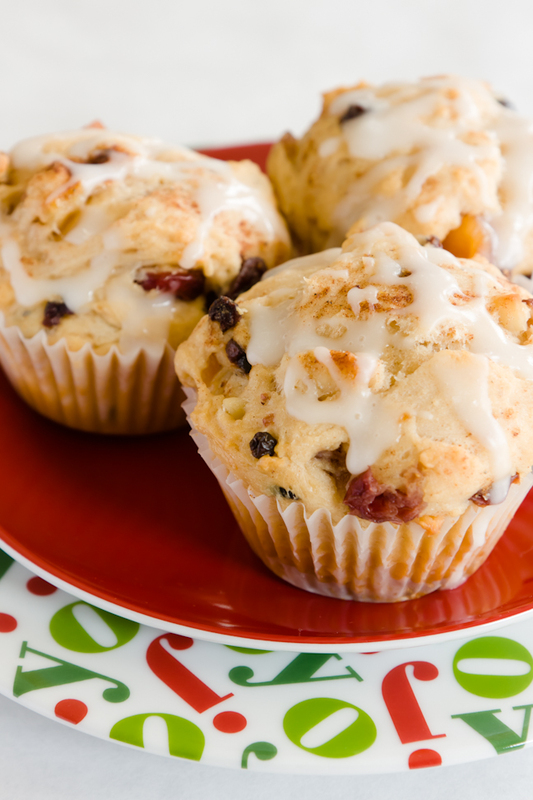 These stollen cupcakes are breakfasty and would be best served on Christmas morning - they are loaded with fruit but they are certainly not the dreaded ultra-heavy fruitcake. Mix the dried fruit, cherry liqueur, and 3 tablespoons of brandy in a small bowl and set aside. Dissolve the yeast in the water in a large bowl. Let the mixture rest for five minutes. Heat the milk, 3/4 cup sugar, and salt in a small saucepan, stirring until the sugar is dissolved. Remove the milk mixture from the heat and add the remaining 1 tablespoon of brandy, vanilla extract, and almond extract. Let cool. Add the milk mixture to the yeast. Gradually mix in 1 cup of the flour, beating until smooth. The dough will not look like typical bread dough. It will be soupy. Don't panic like I did! You didn't do anything wrong. It will work out just fine! When the dough has risen, punch it down and mix in the dried fruit, almonds, candied orange peel, and zest. Add the eggs, 3/4 cup of the butter, 1/2 teaspoon of the cinnamon, and the nutmeg. Stir in 3 more cups of flour and mix the dough until smooth. Knead in the remaining 1 cup of flour until smooth. Divide batter evenly between 24 cupcake liners. Melt the remaining 1/4 cup butter and brush it over the uncooked cupcakes. Combine the remaining 2 tablespoons of sugar, 1/2 teaspoon of cinnamon, and the cardamom in a bowl. Sprinkle the tops of the cupcakes with the mixture. Bake at 350 F for 20 minutes or until the tops are golden. Mix all ingredients and drizzle over stollen cupcakes.